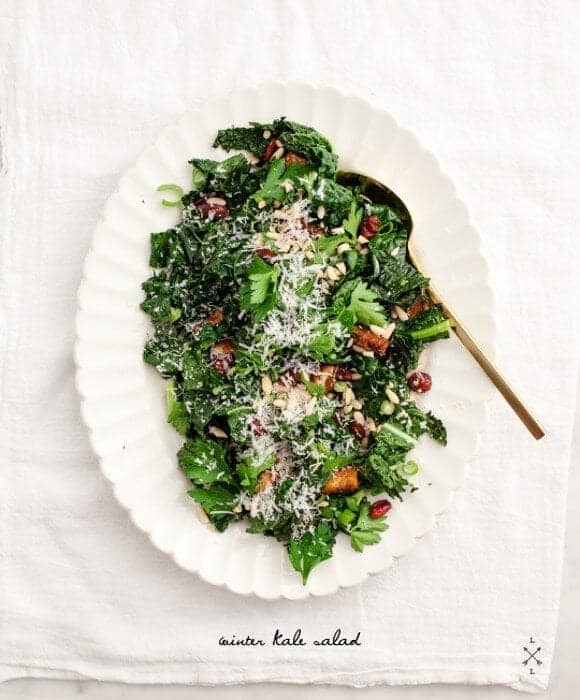 Learn how to roast kale in this delicious, healthy Winter Roasted Kale Salad recipe! Crispy tempeh, pine nuts, and dried cranberries make this salad a satisfying meal. I know, I’ve used a lot of kale lately. It’s my vegetable of choice this time of year, especially when the internet (and even my kitchen, a little bit) is full of sugary, buttery foods. With so much indulgence, I feel the need for balance… but tasty balance. Enter: this roasted kale salad. This was going to be a raw kale salad, but I changed my mind at the last minute and made a roasted kale salad because I was craving something warm and cozy. 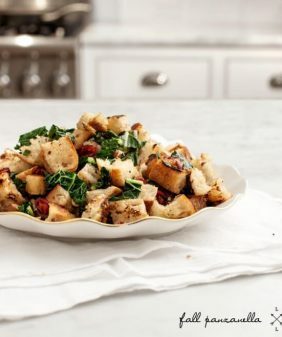 I made my roasted kale in the oven… a method I especially love because it creates two textures in the salad… hearty wilted kale mixed with some lighter crispy pieces. Roasted kale leaves go perfectly with a creamy tahini dressing. And because I live with a cheese lover, I made my salad with some shaved pecorino (not to worry, I also list a vegan alternative). The leftover dressing is great the next day on toast, sandwiches, another salad, you know the extra-dressing drill. To make this roasted kale salad meal I added some tempeh. I quickly cooked it in a pan with balsamic, soy, and a little bit of honey until it got a nice caramelized char. It adds a bacon-esque flavor, but if you’re a meat eater, some crispy pancetta would go nicely here instead. Start the dressing: In a small bowl combine the olive oil, lemon juice, zest, honey, and a few pinches salt and pepper. Give your garlic clove a good smash and drop it in. You’re going to fish it out later, after it sits and infuses garlic flavor into the oil (alternatively, just mince it in). Set aside while you work on the other components. Drizzle the whole kale leaves with olive oil, salt & pepper. Spread into a single layer on a baking sheet (you might need 2). Bake in the oven for 8-12 minutes or until the edges are crispy and the centers are wilted. Remove from the oven and let cool to room temperature. Stack the leaves and chop them, removing the coarser parts of the stems. Set aside. Start the tempeh: Heat oil in a small skillet. When your pan is hot, add the tempeh. Cook on both sides for a few minutes until it starts to brown. Then add a splash of soy sauce and balsamic. Flip around to coat all sides. Add a drizzle of honey and cook a few minutes longer until the sugar and vinegar caramelize a bit on the edges of the tempeh. (This got sticky in my pan, and some of the sugar burned, but that slight char ends up tasting really good). Remove from heat and chop into bite size pieces. Finish the dressing: Fish out the garlic clove (it’s ok if some bits stay in, just try to remove the larger pieces of the skin). Whisk in the tahini, cheese or nutritional yeast, water if necessary to thin it, and a few red pepper flakes. Taste and adjust seasonings to your liking. Toss the kale leaves with some of the dressing, adding as much or little as you like. Add the scallions, cranberries, parsley, and tempeh pieces and toss again. Plate and garnish with pine nuts & more grated cheese. Serve with extra dressing on the side. I have never had much luck with tempeh, but this looks too tempting not to attempt. Thanks for another recipe to try! Keep the kale recipes coming. 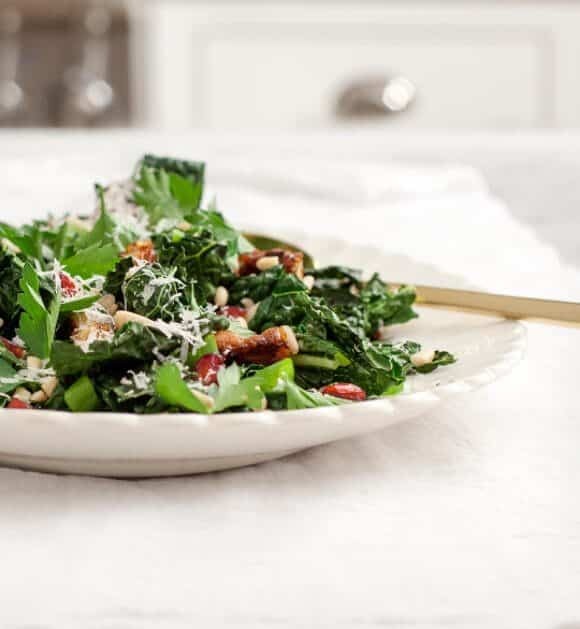 Your absolutely right that with so many pastries, pies and bread dishes abounding in Winter, kale is a welcome daily addition. 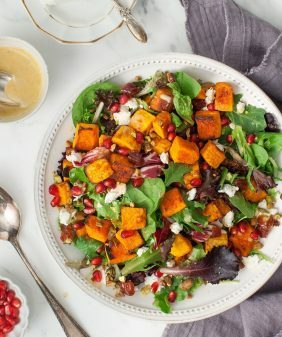 This has a unique twist on a regular kale salad I make with tahini-garlic dressing. I love the idea of roasting it a bit then adding in tempeh with a splash of soy sauce and balsamic. Mmmm! I’m trying this one. Thanks! Kale is an awesome winter green, I think it hits my top 10 list. Glad to see so many recipes! My fridge is full of kale this winter too. I definitely crave it’s leafy greeness, and like you I love the different textures you can coax out of it using different cooking methods. 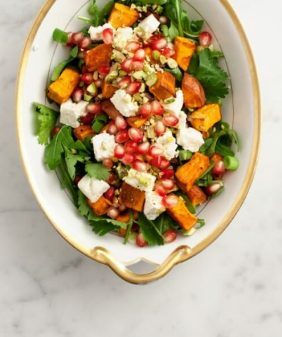 This salad looks spectacular– hearty and filling, without all of the heaviness of typical holiday fare. 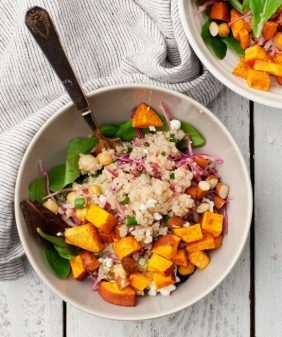 Love the addition of tempeh to this salad! I have been all about kale lately too. I appreciate all the different ideas you have for it. I always feel like I buy too much of it and find myself scrambing for different uses before it goes bad…. So you really help me out. Thanks! Tempeh has not had much luck at my hands but I love how versatile roasted Kale can be! The salad looks gorgeous, Jeanine! I like how you keep the styling minimal, yet make beautiful photographs. Yum! Looks delicious and so festive. I am just as crazy for kale as you and need this balance especially this time of year. I have all the ingredients on hand and will have this for lunch. I do love a big warm salad especially at this time of year when my body (occasionally) demands something other than butter and sugar. 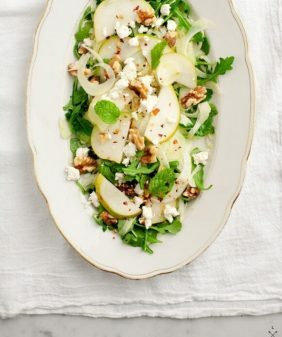 The dressing sounds wonderful too, a real punch of flavour. 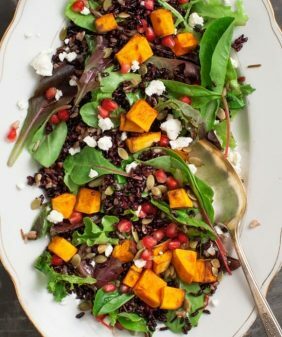 What a wonderful idea to roast the kale for this salad, I’m very much in love with kale at the moment and must try it that way. I happened across this recipe on Pinterest this morning before I went to a holiday potluck. How fortuitous. I mixed the roasted kale with a spicy salad mix from the farmers market, toasted some walnuts, and made the dressing with nutritional yeast. I’m glad I have some kale left so I make it again for myself tomorrow! I love that it has strong flavors but they’re balanced well. hi Stacy, so glad you liked it! I made this for today’s lunch. My husband called from the other room, “can I eat the whole thing?” I think it’s a winner in our house! Thanks for sharing! ha, so glad you both liked it!